The Clone Dialog will show. URL: Input repository URL address, which you will clone from. You can click Browse to browse directory. Directory:Input your local directory, which you will clone to. You can click Browse to browse directory. If you check the Load Putty Key checkbox, clone will auto load putty key file with Pageant. You can click ... to browse for a putty key file. Clone will checkout current HEAD to work space automatically. 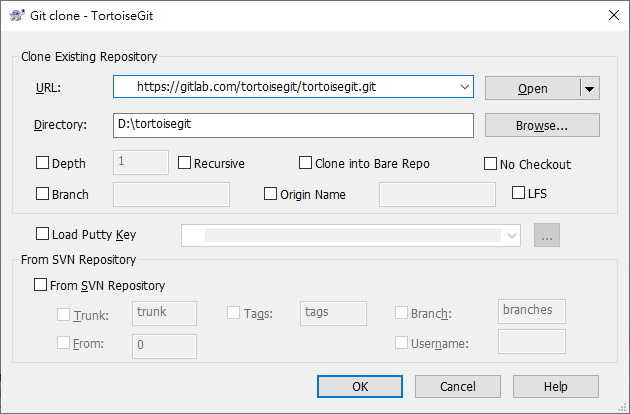 Git clone supports http, git and ssh protocol. the section called “Network Settings” shows how to choose SSH client. OpenSSH, Plink or TortoiseGitPlink.